Happy Monday! I hope you all had a good weekend. I watched a couple of movies, ate yummy sushi (cooked, don't freak out), spent an afternoon in the pool and had some great talks with Eric. We have so much to figure out with this baby-thing (registry! name! schedule!) so it was nice to just go out and talk about adult things. Like, what our dog does when we aren't home, and stuff like that. In other news, my friend Emily bought me this dress for my birthday. 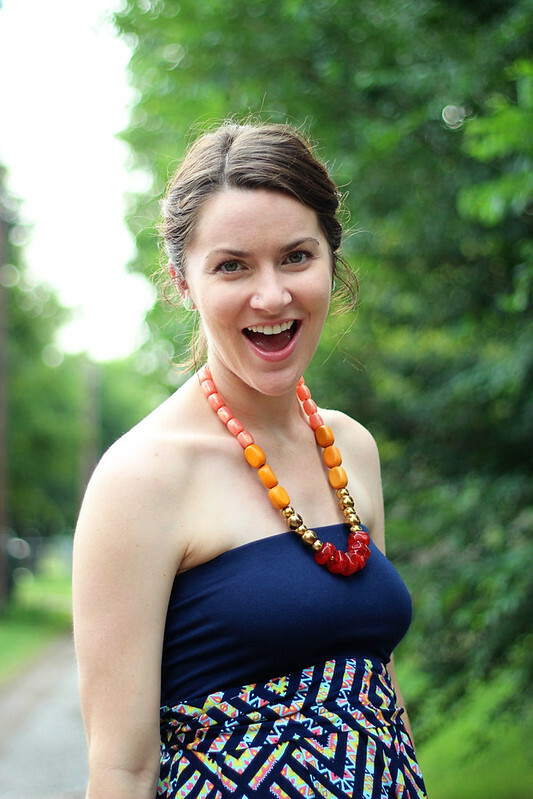 It's the perfect non-maternity, maternity summer dress. I have worn it to the pool, to dinner and I might even be able to pull it off at work with a blazer. So thank you, Emily. 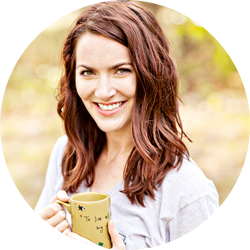 Can I use this blog post as a substitute for a thank you note? Ahhh! You look so dang cute!! You look adorable! Love the pattern and cut of the dress! It's perfect! You're beautiful! Love the dress, love your radiant glow. this dress is gorgeous!! and bump! you are so cute. meanwhile I know way too much about babies and registries cause I like to read and dream and plan so that equals knowing exactly what crib, stroller and breast pump I want. Ok maybe a little too much info, but hey. If you want to ask a non mother who knows nothing about babies her opinion, hit me up. Oh names! the most fun. I cannot wait to hear it :) You can tell me, I can keep a secret. I won't tell you mine so you don't steal it though... jk. but not really. Hello adorable! You look awesome and always manage to make me laugh while reading your posts. How do you do it? Happy Monday friend! love this print ! lovely ! I absolutely love this whole look. Unfortunately I live close to Target, so I'll be heading over to see if I can find it then catch it on sale. This is one of the good things about blogging. Strangers become your shopping friends. I wouldn't have given it a second look online, but the in real life photos shows just how pretty it really is. You can easily pull out any color from the bottom and match cardigans and accessories. Emily has great taste, thank her for me as well! haha, you know us too well-- I was about to flip out about the sushi. What a great friend to get you such a fabulous dress! That print is terrific! This dress is too cute! The print is beautiful! Your friend has great taste. You can definitely wear it with a blazer to work. I hope your week is off to a great start! That dress is just perfect! 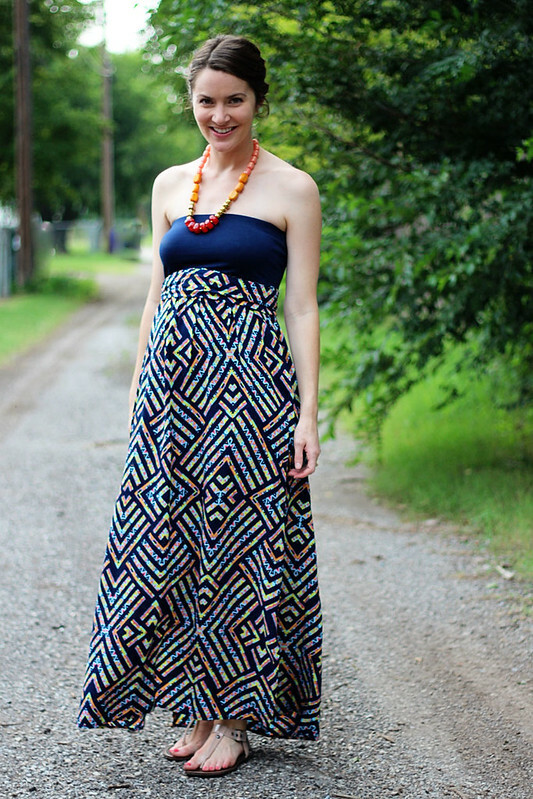 I love how maxis can be worn before, during, and after pregnancy. You look glowingly wonderful! I love clothing that you can wear pregnant or not! This is perfect! It looks gorgeous on you and that necklace is so cute with it! You look so great! And what a cool friend to buy you such a perfect dress. I think I'd be nervous to buy clothes for most of my friends, but she did a great job! That is a cute dress! And you look like such a cute little pregnant lady. I love this dress on you. Looks really adorable and love your baby bump! :) Looking super cute! So adorable! Love this dress. The print is too cute! What a gorgeous dress!!!! I love the print! 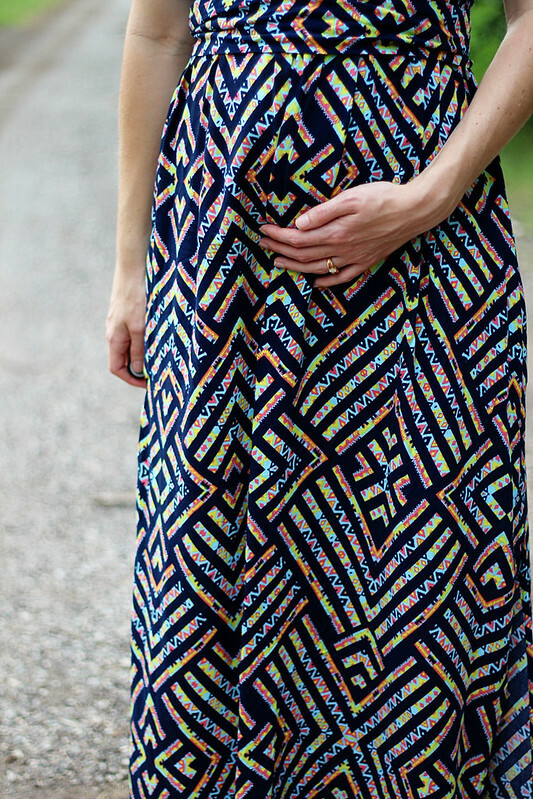 Your lil' bump is looking adorable, especially in that maxi! AHHH you're looking super cute with your growing bump!!! I mean, the dress is great too, but it's just that much better with the bump! 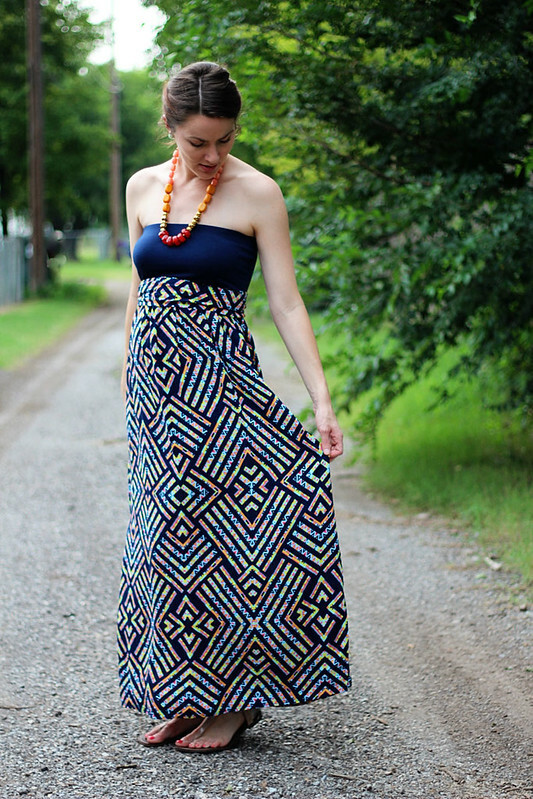 Yay for fun maxi dresses! The pattern on this one is gorgeous. You seriously can't even see a baby bump unless you put your hand under it. Crazy how that works! This really is an amazing dress. You look adorablleeeee!!!! And my only recommendation for "baby stuff" is to get the book, Healthy Sleep Habits, Happy Child. It saved my life in terms of getting baby to sleep! Your friend is awesome! This dress is amazing! I really love the colors and the pattern. Oh and this necklace is the exact perfect length with this dress. you look SO cute pregnant. and in this dress! Cute dress. I probably wouldn't be brave enough to wear a strapless dress to work even with a blazer - I'd feel like I was cheating. Legit conversation my husband and I have 99% of the time we are not at our house: "What do you think the animals are doing right now?" "Probably sleeping." "Yeah, they're cute." Don't you just love Maxis! I think they are the perfect summer dress! I only have two in my close though! Your friend gave you a gorgeous dress - really like the print! 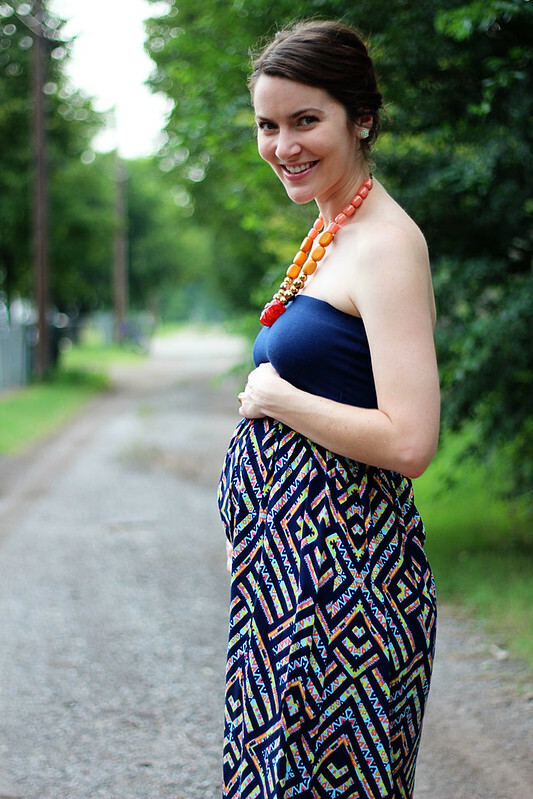 I found non-maternity dresses worked really well during pregnancy, empire waists and stretchy maxi dresses accommodated the bump all the way up to the third trimester!